Livingstone Zambia. The way it was. ZTB ZAMBIA TOURISM BOARD welcomes you to The land of the legendary African walking safari, the Victoria falls, the wild Zambezi River, breath-taking lakes abundant wildlife and raw, pulsating wilderness, all in one friendly country blessed with one of the seven natural wonders of the world and an abundance of wildlife, water and vast open spaces, Zambia offers unforgettable holidays exploring the real Africa. Acknowledged as one of the safest countries in the world to visit, Zambia's welcoming people live in peace and harmony. here you'll find some of the finest Safari experiences on the planet. Face to face encounters with Nature at it's most wild. Spectacular waterways provide a delightful, adrenaline pumping or leisurely playground of activities for all ages. 17 magnificent waterfalls, apart from the spectacular victoria Falls provide " facade followers' an adventure into the remote undeveloped rural areas experiencing a taste of village life. Zambia has the largest water resources in the whole of Southern Africa with 5 massive lakes and plentiful rivers offering excellent tiger and fly fishing, canoeing safaris, house boating holidays, first class white water rafting, kayaking and river surfing - and daily spectacular watery sunsets. A wide range of hi-action activities from safaris deep in the wilderness, to rafting, bungi jumping into the deep gorge below the Victoria falls abseiling, Canoeing down the Zambezi, elephant back trails and walking with lions. Zambia has some of the best Game Reserves in the world, and an incredible natural heritage with nay unique species found only here. Zambia is not an expensive tourist destination this has been revealed by a French tour company that just returned from Zambia on a familiarization tour. This came to light when Mr. Bonnis Sebastien who is the Tourism Product Manager in charge of Asia - East Africa & Southern - Indian Ocean - South & Central America � Caribbean for Eurowings Groupe Talwyne a travel and tour company in France paid a courtesy on Zambia�s Ambassador to France His Excellency Amb. Humphrey Chilu Chibanda at the Zambia embassy in Paris. Mr. Bonnis was part of the European travel agents that travelled to Zambia on a 7-day familiarization tour in May 2015, at the invitation and sponsorship of Zambia Tourism Board in partnership with Ethiopian Airlines. The itinerary included Lusaka city, South Luangwa National Park and Livingstone. Mr. Bonnis informed the Ambassador that before traveling to Zambia he had a different picture of Zambia as a tourist destination for the Europeans. However, Mr. Bonnis said he was amazed at the tourism development in Zambia. He said his experience in Zambia is something he will never forget. He said his experience in South Luangwa is one he shall forever cherish in his life of travel. He informed Ambassador Chibanda that he was surprised at the abundance of wildlife in South Lungwa National Park, he said though he has never been to other parks in Africa, other travel agents that travelled with him on this tour, some of whom have had a chance to visit other parks in Africa confessed that South Luangwa is one of the greatest wildlife sanctuaries in the world. The concentration of animals around the Luangwa National Park, and its lagoons, is among the most concentrated they have ever seen. �Imagine we were able to see all the African big Five with 2 hours of our first tour of the park I don�t know if lucky was on our side that day but I think it was just amazing,� said Mr. Bonnis. On Lusaka Mr. Bonnis said he was amused at how fast the capital city of Zambia is developing which is a good for city tourism. He said Livingstone is truly the tourist capital of Zambia as one can find and do all tour activities in place, it is an amazing tourist destination within Zambia. The Helicopter flights and the cruise on the Zambezi River are just some of the best activities in Livingstone that Mr. Bonnis sampled. He said a visit to the Victoria Falls one of the 7 natural wonders of the world is a must be on the list for any for any tourist visiting Southern Africa. On the Zambian people Mr. Bonnis said he had never imagined that Zambians could be so friendly the Zambian people where ever we went were so nice and willing to sell the country from waiters, tour guides to managers and tourism officials that we met. Mr. Bonnis told Ambassador Chibanda that he has already started planning on a tour for himself and his colleagues back to Zambia. Nevertheless, Mr. Bonnis called on Ambassador Chibanda to do more marketing activities to make Zambia known in France. �Your Excellency, you have an amazing country and you have a lot to offer to the French market. The only problem is that Zambia is not yet competitive in France as a tourist destination of choice. You need to do more marketing activities to make the French population know what Zambia offers,� said Mr. Bonnis. He also bemoaned the lucky of a direct flight from Europe into Zambia. LIVINGSTONE, Zambia � For the first time in the United Nations World Tourism Organization�s (UNWTO) history, their General Assembly (GA) was co-hosted by two countries � Zambia and Zimbabwe. The UNWTO jointly assembled its GA in both Livingstone on the Zambia side and in Victoria Falls on the Zimbabwe side of the famous falls. This events has been the best-attended General Assembly in the history of the UNWTO, said Taleb Rifai when he addressed the media at the ongoing 20th edition of the Madrid-based organization. When asked about the challenges and opportunities about having Zambia and Zimbabwe as co-hosts for the historic event, UNWTO Secretary-General Taleb Rifai had much to say. He said: �When we assemble meetings at UNWTO, we assemble them for a purpose - to send a message from the place, from the continent, and to the people that we are here for them. Having two hosts to a General Assembly is not easy. There are different authorities on both sides, different interests, different capabilities, and different priorities. But, I must say the cooperation between the two countries has been remarkable. We are very much impressed on how the two countries are willing to work together, the amount of goodwill � to make this a success is tremendous." He added, however, that �We understand that this is not a big place; this is not a big city compared to facilities and infrastructure. We understand the limitations, but that is precisely why we are here. We think that by coming here, history would have been made here in Africa. The people are excited, the people are happy, the people are smiling, and the people will talk about it for years and years to come. This is very different from holding a meeting in a big city or a developed country, where [this would've been] just another event. This is not just another event." This article is made available as a service for journalists to use for dissemination. Information is available to use without copyright. The 20th UN World Tourism Organization�s General Assembly, which is ending today after being co-hosted by Victoria Falls and Livingstone, the twin towns across the Zambezi rivers, has yesterday re-elected Dr. Taleb Rifai for a second term of office for a further four years. Dr. Rifai has championed the cause of advancing Africa�s tourism industry and been seen as instrumental in developing mechanisms and plans to have the African continent claim a fairer share of global travel movements, which while in excess of 1 billion last year only saw some 53 million travellers, or a meager 5 percent, generated for Africa. Dr. Rifai is also credited for bringing the 2013 General Assembly meeting to Africa where Zambia and Zimbabwe co-hosted the meetings, producing some added focus on Africa�s tourism attractions. While the UNWTO is expected to release a full documentation about the meetings� agenda, discussions and resolutions made, notably did two announcements important for Africa come out at the earlier stage of the event. Mrs. Elsia Grandcourt, immediate former CEO of the Seychelles Tourism Board, was appointed as the UNWTO Regional Director for Africa followed by the election of Mr. Alain St. Ange, the Seychelles Minister for Tourism and Culture, to the UNWTO Executive Committee. Congratulations to Dr. Rifai on his re-election for another term of office and again to the Seychelles delegation for their success in securing the two positions. As the 20th General Assembly today moves from the town of Victoria Falls in Zimbabwe to the twin town of Livingstone in Zambia, separated by the mighty Victoria Falls of the Zambezi River, news have emerged that global travel, compared to 2012, has risen during the first six months by an unexpected 5 percent, ahead of forecasts and by some seen as a brilliant performance considering the ongoing economic woes in key markets around the world. Details provided by UNWTO to this correspondent show the following breakdown vis a vis global regions: �International tourist arrivals grew by 5% during the first half of 2013 compared to the same period of 2012, reaching almost 500 million, according to data just released by UNWTO. Growth was above the projection made at the beginning of the year (+3% to +4%) and is also exceeding the trend of the UNWTO long-term outlook Tourism Towards 2030 (+3.8% a year). Destinations around the world welcomed an estimated 494 million overnight visitors in the first six months of 2013, according to the Advance Edition of the UNWTO World Tourism Barometer released on the occasion of the UNWTO 20th General Assembly. This represents an increase of 5% or an additional 25 million international tourists compared to the same period of 2012. Growth was stronger in emerging economy destinations (+6%) than in advanced economies (+4%), a trend which has marked the sector for many years now. �The fact that international tourism grew above expectations confirms that travelling is now part of consumer patterns for an increasing number of people in both emerging and advanced economie� said UNWTO Secretary- General, Taleb Rifai before adding: �This underlines the need to rightly place tourism as one of the key pillars of socio-economic development, being a leading contributor to economic growth, exports and jobs�. In a still uneven global economic environment, results were positive in all regions and subregions, though the overall picture was mixed. Europe (+5%) performed surprisingly stronger than expected, driven by Central and Eastern Europe (+10%) and Southern and Mediterranean Europe (+6%). Asia and the Pacific (+6%) also exceeded expectations, boosted by South-East Asia (+12%) and South Asia (+7%). On the other hand, results were weaker than anticipated in the Americas (+2%), as South America and the Caribbean lagged behind. The first semester normally accounts for some 45% of the total arrivals count of the year (the Northern hemisphere high season months of July and August fall into the second semester). Growth is expected to continue in the second half of 2013 but at a gradually slower pace. UNWTO forecasts 2013 to end at 4% or slightly above, thus exceeding the initial estimate for the year. Zambia adds Zest to your Real Africa Safari. Who wouldn't be awed by their first sight of Mosi- O-Tunya, the smoke that thunders, or by the denizens we encountered up close on, eye to eye on our Lower Zambezi canoe safari. Zambia is a fabulous place to get around, thanks to its regional airlines and highways system This meant we covered much more territory than expected and saw more of the sights. The country's elevation allows for a more pleasant climate than one would expect in a tropical country - all the more reason to plan an encore. Zambia hosted successful ATA events in 1981 and 1993 - however the Africa Travel Association's 28th International Congress in May, 2003 was the first "double-header," with Lusaka and Livingstone -Victoria Falls sharing the honors. There's something magical about any ATA event, and our Zambian friends added their own zest to the menu. We call it going for the gusto! For business, networking and professional presentation, the Trade Show at Lusaka's InterContinental Hotel was a sure winner. To catch some of the Congress action and attractions, see our magazine's 11 pages of photo archives plus our AWARDS page and comments by key participants and presenters. To drum up advance interest in "The Real Africa," Zambia's National Tourist Office staged a USA Road Show, aided by ATA's Southern California, Atlanta, Washington and New York chapters. These venues helped ensure a large, enthusiastic attendance at the event's launch in Lusaka. At the Congress opening address, Zambia's President, Hon. Levy P. Mwanawsa (right) was upbeat about tourism's potential, echoed by the theme "Ethno Tourism: A key to sustainable development and job creation." In this positive vein, he stressed the importance of increasing tourist flow from North America to a wider range of African destinations. The President welcomed all ATA delegates at a sunset reception in the spacious gardens of Government House. Photo (top): ATA delegates taking a time out to catch the spray at Victoria Falls. Above: President greets delegates. Left: H.E. Martin Brennan, U.S. Ambassador to Zambia; Ms. Mira Berman, Executive Director, ATA; Hon. Zakia Hamdani Meghji, Minister of Natural Resources and Tourism, Tanzania, and ATA President; H.E. Levy P. Mwanawasa, President, Republic of Zambia. H.E. Martin Brennan, United States Ambassador to Zambia hosted ATA delegates at the beautiful embassy complex in Lusaka. He too expressed confidence that, if managed properly, tourism can be a catalyst to better infrastructure development and conservation. He believes that tourism should be seen as more than just an income generator, but as a tool for transforming the world into a global village. Brennan was pleased to announce that the U.S. government will provide $9 million for natural resource management in Kafue National Park and Zambezi-Chobe area, including a program for training Africans in tourist services allocation because it does not only consume but generates resources and wealth." His Co-Chair, H.E. Prof. Mwelwa C. Musambachime, Zambia's permanent representative to the United Nations tackled the timely topics as moderator for "Community-based Tourism as a Driving Force," which focused on cross-ministerial and intergovernmental measures for fostering sustainable development. Why does Africa continue to attract business and tourism despite negative influences, empty rumors empty chit chat from the media's talking heads? "Hosting the congress in Zambia is testimony to Africa's stability in the face of current global conflicts and the (tourism) industry's weakened situation, " said ATA President, Hon. Zakia Hamdani Meghji, Minister of Tourism and Natural Resources for Tanzania. "We are all here because we are optimistic about the future of global travel, specifically to the continent of Africa. ATA member countries, representing most of Africa's major tourism destinations, are recognized by the more sophisticated traveler as among the world's most safe and stable countries to visit at this time," Meghji continued. Photo : Hon. Meghji (above) with IIPT President Louis D'Amore. Below: Mira Berman, Hon. Patrick Kalifungwa, Hon. Zakia Meghji and Gaynelle Henderson-Bailey, 1st Vice President, ATA. Continuing on a high note, ATA Executive Director Mira Berman of New York spoke of industry partnerships with the World Tourism Organization, United States Tour Operators Association, International Ecotourism Society, American Society of Travel Agents, Corporate Council for Africa, Association of Retail Travel Agents, RETOSA (Southern Africa) and SATH (Handicapped Travelers). Berman touched on key ATA projects, such as Bermuda's African Diaspora Heritage Trail, and Africa's Second IIPT-ATA Peace through Tourism Conference in early December, 2003. With RETOSA playing an active role in promoting tourism from North America to Southern Africa's 14 nations, it is significant that the ATA Congress in Zambia set the stage for other key events. One of the most important venues of the year is the (SADC) Heads of State Summit in August. Africa Travel Magazine's SADC Summit edition features a 32-page Zambia Tourism insert featuring Congress highlights and photos. 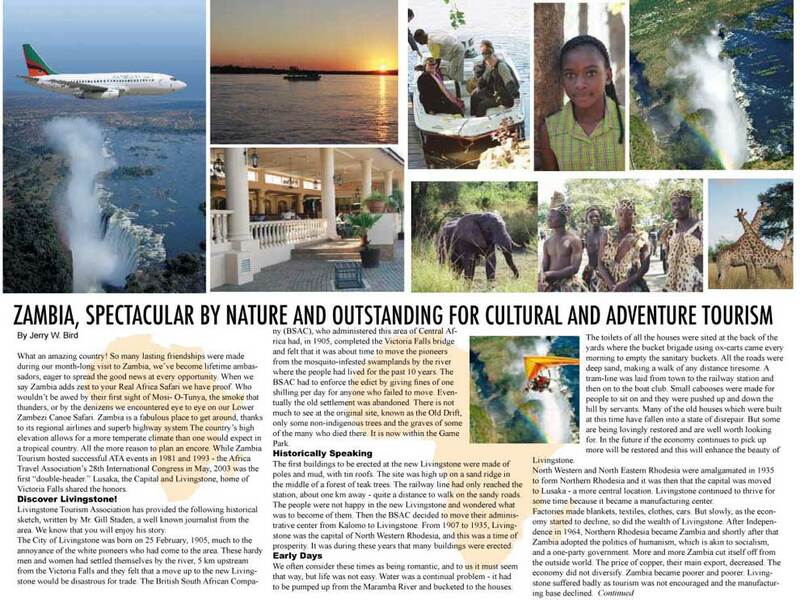 The Zambia supplement will be expanded in future issues as ATA strengthens its bonds with the tourism industry in Zambia, a staunch supporter since 1981.